As I have mentioned before, we are distinctly fussy about taking on self-published books, but made an exception in this case. 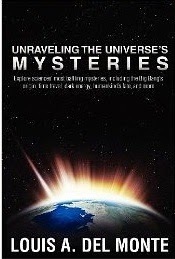 ‘Unraveling’ combines an exploration of the currently accepted cosmology with some speculative alternative physics ideas and even a quick discussion of the existence of God. Although I was prepared to set aside an aversion to self-publication, it does show through quite strongly in this book, and I ought in all fairness to mention the bad side of this first. Like almost all self-published books, the print layout on the page looks wrong – more like a Word document than a book. This isn’t insuperable, but mildly irritating. What’s worse is that it is very clear that the book hasn’t been professionally edited (or if it has, the author should get his money back). There are far too many errors. So, for instance, when talking about string theory, at one point it is sting theory, and at another spring theory. Professor Ronald Mallett, who is discussed at some length, quite often only had one ‘t’ in his name. And so it goes on. Putting that aside, what we get here is a combination of a quite reasonable introduction to the big bang and string/M theory with some personal speculation from Mr Del Monte and an interesting exploration of some ‘mysteries that still baffle modern science.’ I ought to divide this into three: how well Del Monte does at explaining the basic science, how readable the book is, and what to think of Del Monte’s original theories. Most of the basic science is good and some is reasonably well explained. The author is a lot better on cosmology than he is on quantum theory and relativity, which can be rather confusing in the way they are covered, but overall it’s a workmanlike job. What is slightly worrying is that the author doesn’t seem to understand special relativity, as he suggests that the ‘twins paradox’ is presented as only being an illusion, because the effect is symmetrical. This runs counter to even undergraduate level physics – in any special relativity textbook it is clearly explained why the twins paradox is real and not an illusion because the symmetry is broken – one twin is accelerated and the other isn’t. That’s worrying. As for the readability, the book starts off pretty well in an approachable, quite chatty fashion, but it suffers from not having any clear structure, jumping episodically from chapter to chapter, and there is no evidence that the author has any great expertise in science communication. There’s nothing particularly new in the basic science here, and there are plenty of other books on cosmology and string/M-theory that do the job of getting them across better. We are left with the author’s own theories. I have a problem here. I have no issue with a working scientist with academic standing presenting their own, speculative theories. However when someone without appropriate credentials does so, it is worrying. Del Monte has a masters in physics and then spent his working life as an engineer. Nothing wrong with this, but it does not make him a ‘physicist’ as he is described, and it does not give a great deal of weight to his theories. To be fair I am not saying that they are in the typical ‘Einstein was wrong, my new theory shows why’ fruit-loopery class. There is some interesting reasoning here – but I am not qualified to say if there is anything of interest, and neither, really is Del Monte. Taking all this into account, this isn’t a bad book, but the combination of self published, poorly edited, not brilliantly written, and combining nothing that isn’t done better elsewhere on standard cosmology with some pet personal theories does not make it one I can recommend either.